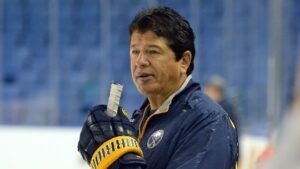 After earlier rumors, it has been confirmed that Ted Nolan will continue his career as an international coach this coming season, joining Team Poland as their new bench boss. A native of Sault Ste. Marie, Nolan blazed a trail when the First Nations former reserve resident was drafted 78th overall by the Detroit Red Wings in 1978. He went on to play in the NHL for three seasons, but has been far more successful at the coaching level. In addition to a Jack Adams Trophy as head coach of the Buffalo Sabres in 1997, when he helped the team to first in the then-Northeast Division, he’s spent three years coaching at the international level with the Latvian team. Now, he’ll join Poland’s staff, looking to help a developing hockey nation elevate their game to the next level. At the moment, Team Poland is ranked 20th internationally by the IIHF for men’s hockey, and currently play in the Division IA second-tier level for the IIHF Men’s World Championships. Although they’ve been ranked as high as sixth overall at a point in the team’s history, the last time Poland made it to the Olympics was in 1992; with Nolan at the helm, the hope is likely that they’ll at the very least look to develop into a nation that’s capable of putting up a fight in qualifications in the coming years. At the moment, this is Nolan’s only gig, but success could help him find a way back to prominence coaching in North America at some level in the future.